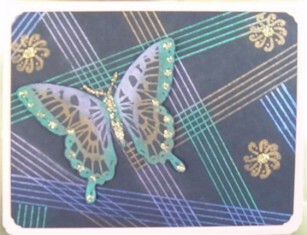 Stamp Butterfly on black matte card stock with Perfect Medium ink. Using paint brush, apply Jewel tones and Gold Perfect Pearls (Metallics Kit). Cut out Butterfly and set aside. On black matte card stock, stamp Lines and Swirl stamp several times with Perfect Medium. With paint brush, apply Jewel tones and Gold Perfect Pearls. Attach Butterfly with foam dots. Embellish with gold glitter glue. Attach to matching card stock.